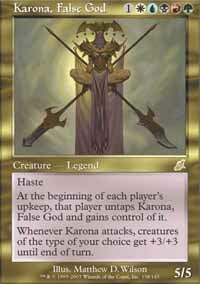 Karona, False God was a complete badass that came to us from the Scourge set. 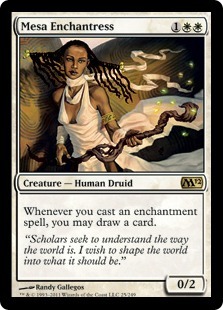 She was the manifestation of all Dominarian mana, an awesomely powerful being encompassing all five colors. According to her wiki, her powers stemmed from faith, being able to do anything people believed of her. If people believed she could suplex Emrakul, the Aeons Torn, she could goddamn suplex Emrakul. Basically, you didn’t want to mess with her when her worshippers were around. Fortunately for her, Karona was never without followers. The False God was such a baller that everyone who saw her instantly started worshiping her as their own god. Once, she simply appeared inside a coliseum and suddenly the audience turned into a fanatical mob that tore down the stone foundation in their desperation to get closer to her, killing thousands in the process. Talk about a rock star. With these godly powers, Karona set for herself the modest goal of conquering the entire continent of Otaria. But she didn’t want to get her hands dirty carrying out this task. Instead, she turned to the tribes of each of her followers and gave them a simple decree: wage war for her. And they did! Karona sat back, relaxed, and watched civil war tear apart the land while casually sipping a mojito. Karona comes out the gates guns blazing, swinging immediately as an 8/8 or rallying a tribal army with a whopping +3/+3 bonus. But she wants EVERYONE fighting, so she hops over to the opponent’s side to lead the charge there as well. She dishes out serious damage but, unlike practically every other creature out there, she’s not yours to control. Instead, us planeswalkers are simply pawns for her amusement, where only she can be crowned the true victor. Unlike most old legendaries, power creep has not affected Karona’s playability simply because no other creature shares her incredibly unique mechanic. She remains this big, crazy general that leads to blowouts – either in your favor or against you! 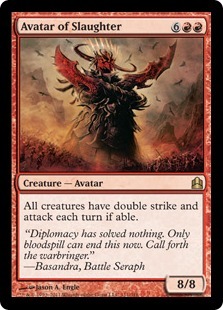 Think about it: in a typical 4-player Commander game, Karona comes out and is immediately contributing a minimum of 8 damage on your turn, and then another 8 damage on each other player’s turns. By the time it comes back to you, Karona will be dealing a minimum of 32 damage around the table. That’s just by herself. If the table directs her to, she can deal 21 commander damage and kill off an opponent on the turn she was cast. The only trick is to make sure that your opponents don’t decide to deal that damage to you, of course! Yep, the Vows. Never have they been sweeter in a deck. Suit up Karona with one of these and let her loose. Not only does it buff her, but it makes sure that she’ll never be swinging your way. This sweet deck concept is not my own. I found it here and instantly fell in love with it. It’s an incredibly novel idea and plays unlike anything else out there, so major props to yugular for creating it! The original list focused on pillowforting and going voltron with Karona. While pillowforting made perfect sense, I felt the voltron package was unnecessary at best and usually worked against me. Karona is already a 3-turn clock by herself so making her any bigger wasn’t necessary. Suiting her up turns her into a threat that demands immediate removal, and without any inherent protection against removal, it’ll happen and you’ll be 2for1’d or more. Worse, setting up a 1-hit kill Karona makes it that much more dangerous for yourself, as she’ll often be one Disenchant away for her Vow to be removed and your game to be over. Finally, if Karona isn’t on the field, your auras are often sitting in your hand doing nothing. Not optimal. So, for all these reasons, I cut out all the voltron cards except for the Vows, which are so friggin’ good that they’re worth the risks. With so much of the pillowfort package being enchantments, it wasn’t a hard step to go deep and turn the list into a straight up Enchantress deck. I didn’t try to force the theme, I just happen to run a lot of amazing enchantments so I added a couple cards that synergize with them, such as Mesa Enchantress. So, here’s my Karona Enchantress list! Pillowfort. Play Karona. Make yourself unable to be attacked by her. Sit back, relax, and watch your opponents kill each other for you while casually sipping a mojito. We accomplish this goal with a few steps. We don’t want to be attacked by Karona. The aforementioned Vows are fantastic at doing this, but it’s not our only options. Other enchantments like Propaganda, Ghostly Prison, and Sphere of Safety generally force your opponents to choose between casting more/bigger spells on their turn or attacking you. This is an incredibly effective way at diverting attacks to other opponents. Outside of enchantments, we have cards like Spike Weaver and Knight-Captain of Eos, repeatable fogs that can compel opponents to strike elsewhere. Fog Bank as well as lands like Mystifying Maze are excellent methods of shutting down solitary heavy hitters like Karona. In the same vein as pillowforting are “rattlesnake” cards that warn of bad things happening if people attack you. Are you sure you want to attack me knowing that I’ll block with High Priest of Penance or Archon of Justice and blow something of yours up? Probably not. Similarly, Seal of Primordium and Seal of Cleansing are fine sitting on the board as a silent warning to potential attackers. Of course, if a big threat needs to be dealt with, you can also pop them early to take it out. Oh, and Blazing Archon, obviously. So you’ve established your fort and now you’re safe and secure from your opponent’s armies. But your opponents also want to protect themselves, so they sit back with their creatures and do nothing. Boring! How about we shake things up and FORCE them to attack? Believe it or not, we’ve got cards for that! Grand Melee, (Fumiko the Low Blood), and Avatar of Slaughter make your opponents attack. They can’t attack you because of your fort, so they must attack each other. You don’t have to lift a finger as they kill each other for your pleasure. I can't help but cackle like a sith lord as I watch the carnage. It’s glorious. This, my friends, is how you take Pillowfort to the next level. Typical green stuff, for the most part. Sakura-Tribe Elder, Farhaven Elf, (Kodama’s Reach), yadda yadda. Notable enchantment ramp are the staples (Mirari’s Wake) and Mana Reflection. (Dawn’s Reflection) and Trace of Abundance are also used here for more ramping goodness. Trace is especially good because you don’t risk being 2for1’d by Strip Mine. 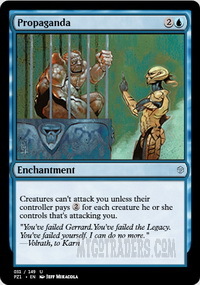 I don’t think I’ve ever singled out my favorite green card in Commander, Oracle of Mul Daya. Not only is she ramp, but she’s also card draw when you’re playing lands from the top of your library. So good! I’ve already proclaimed my love of Mystic Remora and Rhystic Study, so I won’t repeat myself. Run them, love them. With over 30 enchantments, Kor Spiritdancer, Mesa Enchantress, Verduran Enchantress and (Enchantress’s Presence) keep your hand nice and full. It’s an incredibly powerful draw engine and lets you run away with the game if they’re not removed. For tutors, we got Three Dreams, a very potent 3for1 tutor. Snag a Vow for Karona and (Faith’s Fetters) for a problematic permanent. It’s not card draw, but it’s certainly huge card advantage when you play Retether or Open the Vaults with a graveyard full of enchantments. Resolving a late Vaults usually ends the game. The rattlesnakes are great disruption but there’s far more options available. This deck only runs a single artifact. Because of that, this list can run one of the biggest artifact hosers in the format: Energy Flux. Despite its power, most people have never seen it before. There’s also Stony Silence which is also bonkers against artifacts. 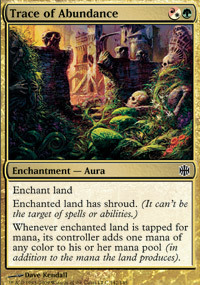 Then there’s the graveyard, which 95% of Commander decks try to abuse to various degrees. Leyline of the Void, Rest In Peace, and Bojuka Bog say no to that. It’s hilarious how many decks are completely screwed over when one of those enchantments resolve. Arrest, (Faith’s Fetters), and Lignify are really nice enchantment answers to creatures, especially opposing generals, because it stops them from being a threat while not allowing them to be recast. Austere Command is a superb board wiper and white staple, while Winds of Rath is a thematic board wipe that can keep a Vow'd Karona alive while wiping away everything else. The greatest advantage of the pillowfort archetype is how effective it is at turning attacks away from you and instead towards other opponents. This doesn’t simply save your life total -- it also indirectly lowers your opponent’s. By holing up in your fort, you’re dramatically increasing the chances that you’ll be one of the last players standing. Probably the biggest positive of this deck, however, is its sheer uniqueness. I’ve never, ever ran into another Karona deck before. Nobody knows the deck’s game plan and that surprise factor lets you carry out your goal with minimal disruption. For the most part, people willingly leave you alone as you arrange your pillows, and will use Karona to swing at other opponents for mega damage without you having to force them. Then, when it’s too late, it’ll be you against the last opponent standing, and victory is all but certain. I’ve also gotten the most compliments about the deck out of any of the decks that I’ve piloted, so that’s nice, too! Sacrifice outlets trump Karona every time. The dastardly villain with a sac outlet will be given control of Karona on their turn and will sacrifice the poor demigod before the turn is up. You must deal with those sac outlets before Karona can be cast. I didn’t run into this problem often, however with the imminent release of Commander 2013, Prossh will be a serious problem if he becomes popular – and I’m betting he will be, because he’s without a doubt the most absurdly powerful commander Jund (BGR) has ever gotten. Arrest him! Enchantress decks in general are weak to, you guessed it, mass enchantment removal. Austere Command is not your friend. Fortunately, I never ran into mass enchantment removal, but if I did it would probably destroy 4 of my permanents, which ain’t great but not the end of the world. The deck isn’t as enchantment-heavy as, say, an artifact deck is artifact-heavy. The card types are diverse enough that mass enchantment removal won’t be a total blowout. Most of my suggested budget increases are the typical stuff: better lands (dual lands + fetchlands), more tutors Demonic Tutor, better ramp Exploration, etc. There are, however, some expensive cards that work especially well in this deck. Replenish is a superior version of Open the Vaults. I’d run both, but if I had to choose between the two, I’d go with the former. Another great upgrade is Argothian Enchantress to go along with Mesa and Verduran. Homeward Path, besides being an excellent way of protecting your creatures from theft, is a mana-light method of stopping Karona from swinging at you. Speaking of protection, Karmic Justice, Privileged Position, and Sterling Grove all protect your things. There are also a few more amazing hosers this deck can run. Torpor Orb is oddly expensive online compared to its physical counterpart and I have no good explanation for it. Still, in a format where a huge percentage of popular creatures have ETB effects, Orb is an enormous hoser when your own deck is unaffected. Stranglehold is another blowout. No popping fetchlands, no green ramp, no tutoring of any sorts, and no infinite turn combos! Stranglehold is a red staple that more people should be running. Of the budget decks I’ve piloted so far, this one was the most enjoyable, and I hope you liked it as well! As usual, please feel free to suggest a budget commander you’d like to see in a future article and I’ll check it out. Really good stuff, you took Karona a direction I've never seen her go. I've seen her as either tokens or combo. Did you think about adding a couple of Counterspells so that you didn't run into the random blowout from Austere Command? Also, were there mana issues? Tough to run 5 color on a budget, but I see people try to do it all the time and occasionally get color hosed. There were also a couple of other enchantment based dudes in M14 (Ajani's Chosen, etc.) did you look into those? In the vid with Vela you mention an inifinite token version of her, what is that? Every Vela deck I've seen has been bad. Some countermagic would be nice mostly against combo decks but I'd avoid anything with UU in the cost. I luckily never was hit by Austere Command and I've never seen other kinds of mass enchantment removal since they're usually too narrow. Never had any mana issues actually. The deck is mostly GW with some U/R and very little B. There's more than enough manafixing from green ramp and non-rare lands. The only thing is that with a budget manabase you're going to be a turn slower because of all those CIPT lands, but honestly that's not a huge deal. I ran Blightcaster from M14 and loved him. I completely forgot about Ajani's Chosen though! That one looks great. For Vela token combo I've seen her go infinite with Time Siev + Thopter Assembly before. You can use her to make Palinchron + High Tide / Deadeye Navigator lethal, and same goes for Nim Deathmantle + Ashnod's Altar + Grave Titan / Puppeteer Clique / anything that makes a token. 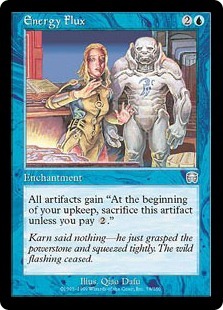 Online, Karona costs $19 on www.mtgotraders.com . If you take out Sylvan Library you can get it down to $15. I found this article and I thought this was an interesting idea, specifically your plan to force your opponents to attack after you set up your pillow fort. Unfortunately a friend of mine looked into the rules involving Fumiko vs Ghostly Prison, (he is a judge of some level) and he told me that the interactions do not work this way. The Ghostly Prison apparently cannot force an opponent to tap mana, so all your opponent needs to do is declare they are attacking you and refuse to pay the mana cost associated with that, then their attack fizzles. This goes against your strategy of forcing them to attack each other. Are they correct about this? Honestly I have no idea. I had an 1v1 situation where Fumiko and Prison were both out and my opponent would tap all his remaining mana before the combat step so he couldn't pay it. I never had an opponent declare attacking me and then refuse to pay it with mana available. Whether this was because my opponents weren't allowed to or they all simply didn't know about this loophole, I can't be sure. I'll try and find the answer and get back to you. It seems your judge friend is correct and at least in a 1v1 situation, the opponent can decide not to pay anything. I have no clue about multiplayer though. Will he still have to attack someone else then to satisfy Fumiko's clause? I really enjoy all of your budget commander articles. Since I don't have a huge amount of time to design decks or much money to put into them, your articles have given this poor old fool a chance enjoy a magic night out with his buds, and a chance tick off a few really competitive players (thanks to the help of Talrand). That being said, I have a couple deck suggestion for you. I would love to see you do a Maelstrom Wanderer deck that uses things like Food Chain to cast Maelstrom Wanderer multiple times to cascade into a ton of good stuff, without going "too" infinite. 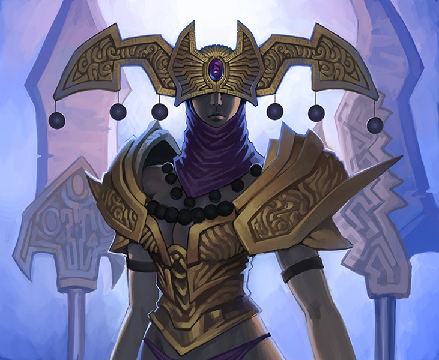 Another commander I'd like to see you build for is Damia, Sage of Stone. I also have a really bad Mimeoplasm Infect EDH deck that I would love to see your take on. Can't wait to see your next budget commander article!